(I started writing this last month, but never posted it. Things tend to get away from me. Finally, posting with updates). We’ve been in this house for almost 15 years, and I have yet to manage to carve out a permanent work/office/studio niche. Over the years, I’ve had to move my office about four or five times for various reasons (people coming, people going, etc.). 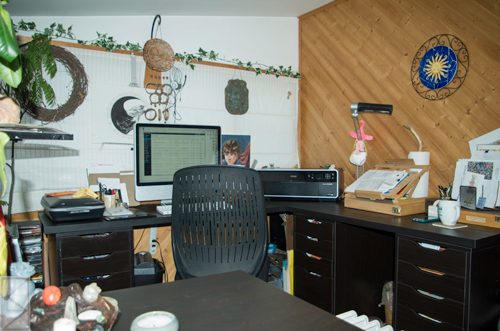 For the past four years, I’ve been sharing my husband’s office space, which eliminated our only guest bed, and my art stuff has been living on a small camp table in the sunroom with the bulk of the art supplies down in the basement. Not the most efficient work set up. And no more overnight guests. When my younger son needed a place to stay while work was being done on his bathroom, the only place he could sleep was on the couch in the living room, which was not ideal. The cats enjoyed watching him sleep, but it would have been better if he’d had a bed to sleep on in a room with a door to keep the cats out. The day after Christmas, our dear iguana died (I’m still very sad) which opened up about four feet of floor space in the sunroom. This sad state of affairs prompted me to move my stuff out of Brni’s office so that we could put a bed back in there for guests. But I soon realized that there was no way I could fit my huge computer desk in the sunroom and still have room for me. My solution is less than ideal, kind of terrible looking, but I think it might work out okay. Here’s my new setup. Milo is dubious about the whole thing. 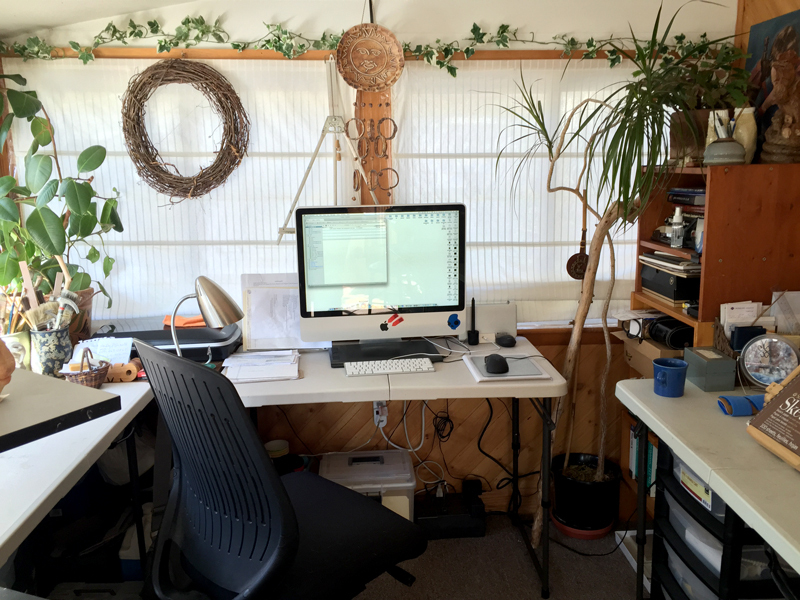 And as it turned out, I found I needed an immediate upgrade to a more efficient and not so ugly workspace. There’s just no inspiration when surrounded by ugly. Off to Ikea I go, right before Brni’s birthday (big party/a future post for that) to get an affordable setup. I found components I could put together with loads of drawer space for all my computer and art stuff, plus an underneath shelf space in the corner for things I don’t use frequently (like my powdered pigments, wax, paints, and other things that I use to create cold patinas on my sculptures). I even have space for my sculpture stand. The table tops (three of them) sit on the drawer/shelf/file cabinet units, maximizing space and making the whole thing really sturdy. It took me two days to assemble the drawer units (four of them) with Brni’s help when my thumbs gave out. I really like this set up. Except for the hideous panelling on the wall. I plan to rip that out in the Spring, replace it with drywall and install above the desk shelving. The day after I put it all together, Brni surprised me with a belated birthday present. 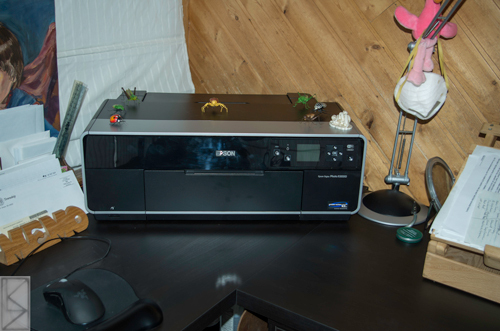 This most fabulous, awesome-est printer! My very old Epson R800 gave up the ghost last year and I just couldn’t bring myself to spend the money to replace it, so I stopped doing my own printing. But this! I can do so much more with this (huge) printer and the quality is superb. There are nine pigment inks with four different blacks! I’m beside myself with the joy of it all (thank you, dear huzban’). 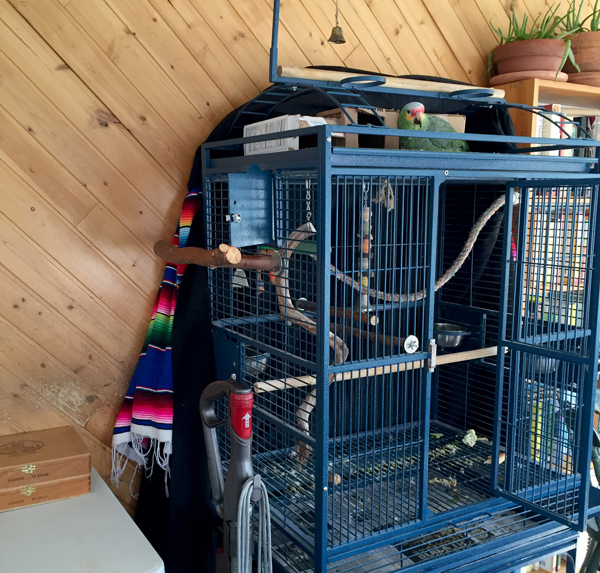 And Milo is so much happier (parrots do not like ugly either). This entry was posted on Thursday, March 5th, 2015 at 3:47 pm	and posted in house, office, printer. You can follow any responses to this entry through the RSS 2.0 feed.